Add a snowball cookie recipe to your recipe box. Snowball cookies were always prominent on the dessert trays when I was growing up in the 1950s, especially around Christmas time. There's nothing like homemade treats for celebrating an old fashioned Christmas and New Year's with family and friends. My wife Vicki says, "I just had these for the first time on Christmas Day. They taste so good! The recipe is my husband's great aunt's snowball recipe." Cream 1/3 cup butter, 2/3 cup sugar, and 2 egg yolks. Add 1 cup drained crushed pineapple and 1 cup chopped pecans. Take a small amount of the mixture and put it between 2 vanilla wafers, making a little sandwich. Freeze them until firm. Roll the frozen sandwiches in Cool Whip® or whipped cream and immediately roll in coconut. Freeze until ready to serve. If you are afraid of issues with the raw egg yolks, you can substitute 1/2 cup cream cheese for the butter and egg yolks. It's a little different flavor, but still very good. 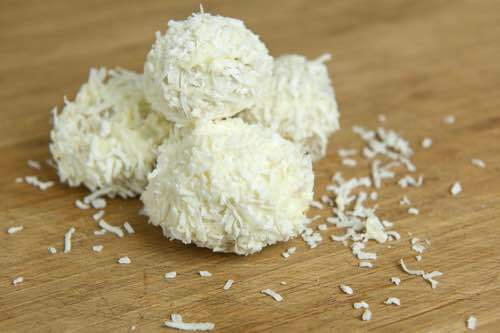 As a child, my mother had me help her make these coconut pineapple snowballs. I have tried for YEARS to find the recipe. THANK YOU! Beat butter until creamy, add vanilla and sugar, and continue beating until mixture is light and fluffy. Add remaining ingredients, shape into balls, and place on non greased cookie sheet. Bake at 350°F for about 20 minutes. Roll in confectioner's sugar when cool. Makes about 3 dozen snowballs. To make Yum Yums, take some peanut butter and roll it into balls. Take half a bag of chocolate chips and melt them in a pot over the stove until sticky yet melted, then take them off the burner. Using a spoon, quickly pour chocolate onto peanut butter balls. Grab coconut shavings and remaining chocolate chips and before the chocolate dries, stick chocolate chips all over to make a spiky ball, or to make a pattern. Stick on coconut shavings. 3 tablespoons Evaporated Milk, 1/2 cup firmly packed brown sugar, 3/4 cup cut citron, 3/4 cup coarsely cut red candied cherries, 1/2 cup coarsely cut pitted dates, flaked coconut. In a saucepan, combine milk and sugar. Cook over low heat, stirring constantly, for 5 minutes. Remove from heat. Stir in fruits. Chill thoroughly. Grease hands and shape chilled mixture into balls by rolling between palms of hands. Roll balls in coconut. Top with candied cherry half. Chill until firm. Makes about 2 dozen. Pasteurized liquid egg yolks can be used instead of raw egg yolks to avoid the dangers of salmonella. Look for them in the dairy section of most supermarkets. This is my 83-year-old mother-in-law's no bake snowball cookie recipe. She always served them on Christmas Eve for dessert. They are absolutely delicious. Spread mixture between wafers, 3 wafers for each stack. Refrigerate overnight. A few hours before serving, frost each stack with whipped cream. Sprinkle with coconut, refrigerate again. Unfrosted stacks can be frozen for later use.